This cover which manufactured using newly developed highly functional stretch fabric delivered to them again. The product not only is excellent fabric, but also handling is easier by adding new technology, it will fit more than ever. Weatherproof high-performance fabric prevents freezing of snow in winter. In the summer it blocks the heat of sunlight. 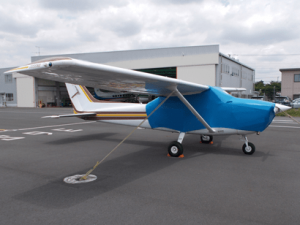 It protects the aircraft while maintaining high waterproof performance unless a hole is opened in the fabric. 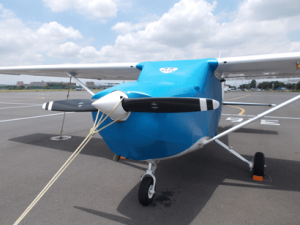 When you stored the cover in a bag, it is 50 cm square compact size and total weight is 5,300 grams, so you can easily load and flight in the aircraft. There is no impact of the wind at all by the fit of the cover exceeded to the limit. 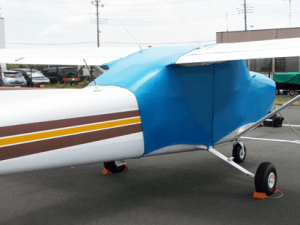 We plan to produce Cessna 206 type next. 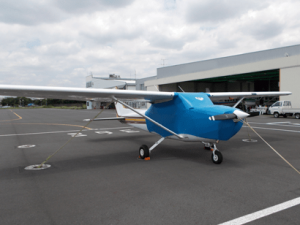 Owner: Sky Photo Co., Ltd. 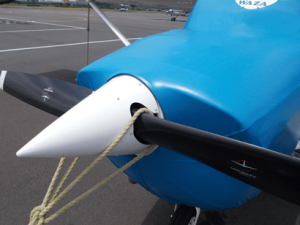 Maintenance and operation management: Asahi Airlines Co., Ltd.
← The cover for the Beechcraft Bonanza E33 has been completed.